Loved these in classic, any chance for SSE port? 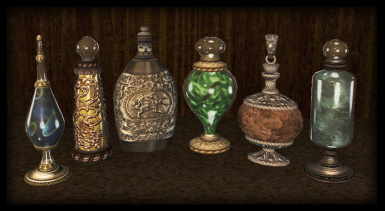 Why sometimes inventory icons of custom made (by alchemy) potions became old vanilla icons? At least part of them, like only poisons. Or all of them. Or all of them is old. It different each time i restart the game. 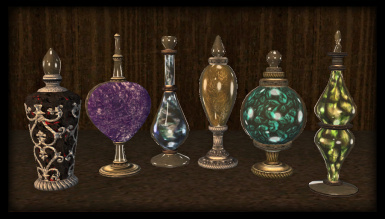 Models ok, and icons for premade potions too. I believe the root of the problem is sometimes they don't get read from the BSA for some reason. With a past character I extracted the files from the BSA and put them in the correct folder structure in the game's Data folder and that solved the problem. 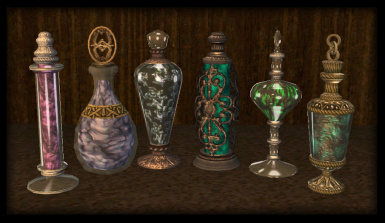 My current character uses a different set of assets for the player created potions (i.e. not from this mod). Can't remember for certain if it was here or in a Nexus Forums posting, but I think I outlined exactly which files I extracted from the BSA in a reply to a post. Which tool best to do this? I didn't extracted those things for ages. I extracted icons by some random bsa extraction tool from nexus, and now it seems to work properly. TY! Hello! I recently downloaded your mod and installed it using wrye bash. I ran into two issues. One, there are no icons for the potions in the inventory. Two, There's a missing mesh where you kill your first goblin, where you pick up your mortar and pestle. If anyone has any insight on how to fix this, I'd greatly appreciate it. Thank you! Turns out i just needed to check the .esp file in the launcher. I thought that wasn't needed as I already had it merged with wrye bash. Absolutely amazing. Endorsed. Now I can get wasted in Oblivion with style. This is one of the best mods here on Nexus! Thank you! Not sure if the author will be reading this, but if you do, I would like to inform you that your mod has a fairly large amount of dirty edits, some of which rename completely unrelated cells to what your mod changes, together with it, there is quite a few records that were changed (likely a Construction Set bug) that aren't remotely related to your mod, like items, books etc. And numerous random items, such as books and a lower class pair of shoes. These all get changed to some odd looking names, and after investigating your mod with TES4Edit, it seems that either you had a different language on your oblivion (assuming by the characters used in the names of the cells that were changed, the language is likely Russian) when you made this mod, or the Construction Set left a ton of bugs behind in your mod. Either way, before you release a mod, just make sure the mod is clean, use TES4Edit to ensure that the mod isn't changing records it shouldn't be changing. This comment is incorrect, the poster must have been looking at the ESP to a different mod. 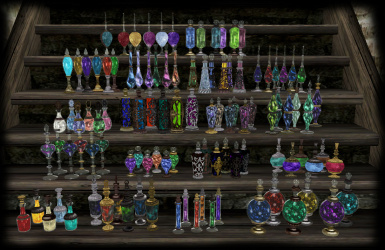 This mod's ESP is 100% clean, it contains Potion records only, nothing else. I just returned to Oblivion, was directed to this from one of those 'recomended mods' lists. Was concerned about the report below regarding dirty edits, almost didn't d/l it. However, when I looked the plug-in over in TES4edit, I found nothing untoward - no books, doors, strange names &c. The textures look great in-game, and in relatively brief testing since installing my game has been stable (that is, as stable as I expect Oblivion to be! . Endorsed.